The Uniacke Union Church Trustees Association was formed in December 1985 by a group of local citizens who were, and continue to be, concerned with the preservation of the building. The Uniacke Union Church was designated a Heritage Property by the Municipality of East Hants in July 1990. The Uniacke Union church is located at 283 Etter Road in Mount Uniacke. The building foot-print pretty much reflects the actual size of the property, the surrounding area being the Union Church Cemetery, an independent trust. The Uniacke Union Church was erected in 1831 for use as a school, but soon after became a meeting house for the community, as well. By the 1960's a new school had been built and the building then served as a meeting house and a place of worship. During the period of time following, the building gained the name "Union Church" because of the number of religious denominations using the building. Formal religious services ended by the 1960's with other churches having been built to serve their congregations. About 2011 a concerted drive was begun to raise funds to carry out repairs to the deteriorating structure. Progress was slow at first but accelerated in the most recent year (2017) to the extent that the stabilization project was successfully carried out during the late summer. The building was raised and the old foundation was removed. A new concrete foundation was installed and the front entry step was replaced. The building was then lowered onto the new foundation. A contractor was engaged to carry out the project. 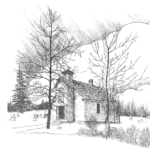 We were fortunate to have 1st Century Movers of New Glasgow take on the challenge - the building has a small footprint with little of its own property surrounding it, and it is located very near a number of grave stones and markers, and access to the site was limited by these stones. The project was completed in 14 working days through August and September of the year. The images following give a little idea of the task facing our contractor. The first photo shows the condition of the building before work started. Day 3 saw the building up on jacks and blocks. During day 4, the old blocks and concrete foundation were broken up and hauled out of the way of work. We then had our first good look under the building - imagine - the original floor structure has trees for joists! The floor planking appears to be milled 2-inch thick boards averaging 18 to 24 inches wide. No nails here - the supporting beams were jointed into the sill plates using the "mortise and tenon" method. Excavation began on day 4 and was largely completed by day 6. By day 8 the new footing had been formed and poured, and the forms stripped. Wall forms were erected on day 9 and concrete went into these forms on day 10. It is a tradition to place a coin under the sill on the foundation - perhaps a good luck piece - usually from the year of the construction. In this event, we placed a "Canada 150" celebration coin under the north-west corner. The building was then lowered onto the foundation. By day 14, the foundation had been back-filled and the area around was neatly landscaped. A new concrete step was formed and poured for the entrance to the building. Some time late, two volunteers replaced the lower three courses of shingles on the north and east walls. Next year - 2018 - the lower three courses on the south and west walls will be completed. Mrs. Philip Pacey, Halifax, NS / Ms. Thersa Stevens & Mrs Ruth Stevens-Mulhall, Mount Uniacke, NS / Mr. Kevin Barrett, Nova Scotia Heritage Development Fund / Mr. Peter Delefes, Heritage Trust - Building at Risk / Municipality of East Hants - Heritage Incentive Program / Mr and Mrs Charles Mason, St. Margaret's Bay Road, NS / Custom Machine & Tool Ltd., Mount Uniacke, NS / Maritime Diesel Services Ltd., Mount Uniacke, NS and many others who helped fund this project. We were most fortunate to have the support of Peter Delefes (Buildings at Risk) and Rosanne Bland (Uniacke Newsletter) as we worked through fundraising and locating a contractor to complete the task. Thank you both for your dedication and support. 1st Century Movers was faced with an awkward area in which to work. Excavation debris and construction materials were laid down around the building during the course of work. Grave stones were close to the edges of the work area. completion of the project left the area clear of debris, with a bit of nice landscaping around the building. Our thanks to Sheldon Rushton, Lee-Ann and Brad and members of his work crew for a job well done. The front entry system is collapsing and it should be dealt with as soon as reasonably possible. The entire doors-and-frame arrangement must be restored. And in order to retain the heritage designation, the front door arrangement must be restored in the original style. The roof is of unknown origin - is it the original roof or a replacement from some era in the past? The roof is made up of what appear to be tin tiles, interlocked and nailed down. There is evidence of water damage on the ceilings in the building, suggesting that this should be the next stage in the restoration of the building. Renovations started on August 20, 2017. These are just some of the pictures that were taken during the renovation. There are more to see in a file on the back of our website. On behalf of the community of Mount Uniacke and beyond, I would like to thank Eric and Arlene for the never-ending dedication they have both shown to the well-being of the Heritage Union Church - yesterday, today and hopefully into the future. There is still a lot of work, time and effort to be put into the restoration and preservation of this wonderful piece of Mount Uniacke's history - the second oldest building (next to Uniacke House) in the community of Mount Uniacke - and we encourage the community of Mount Uniacke and beyond to get involved in assisting with this project and see it through to its completion - the sooner the better. We have a passionate community and it's a pleasure to assist in maintaining a bit of the heritage that made us who we are today.